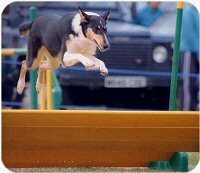 Anyone who is already competing in Agility will know what a buzz it is to run a Rough or Smooth Collie. 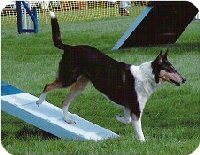 The Rough & Smooth Collie Training Association (RSCTA) Agility League was introduced in order to promote the Rough and Smooth Collie in agility and to promote the [R & S] Collie as a working breed through the support of working events. It's purpose is to give their owners the opportunity to monitor the progression in their dogs' ability and give them something to aim for. Our purpose is not to have these two lovely breeds thought of as just 'show dogs' and the RSCTA hopes to encourage breeders to produce dogs with real working abilities and not just good coats and pretty faces! Joining our Leagues will support the aims, but will also enable your name(s) to become known to other handlers within these breeds so that hopefully you can meet up at shows to swap ideas and cheer each other on! The Rough & Smooth Collie Agility League is pleased that some new partnerships have been doing well this year, and encourages all Rough & Smooth Collie agility handlers to join them for 2014. A new Rally League is now available for members to join. There is also a new Heelwork To Music League results of which can be backdated to the start of 2013, so get organised and join these new Leagues. Ann with Maggie for winning Grade 1 Agility on 7 Sept and going Grade 2! Points for Rally now feature in the Versatility Awards. Well done to Ann Fuller with Plaisance Olive La Belle (Maggie) and who gained their TD Level 1 Championship for obtaining 6 Ace scores at Level 1. Shortly followed by their PD Bronze Championship. There are more new names on the Roll of Honour so well done everyone! This scheme is proving very popular and it is great to see so many demonstrating how versatile Rough & Smooth Collies can be. Several other breeds have contacted us to get permission to set up similar schemes. Well done to Jane Page with Tanly (Norfield Oh! What a Knight) for winning Grade 1 Agility at Adams Show 25 August 2012 and going to Grade 2!! Well done to Paul Sensky & Quincey for winning into Grade 3! They won the Grade 2 Jumping at Dog Vegas in May, giving them the 3 jumping wins required to move up. Well done to Karen Hugo and Skye for winning Grade 1 Agility to move into Grade 2 at the same show!!!! Sarah Davis & Tilly (Cownbred Shecan Cancan) qualified for CSJ Novice Agility Final held at the Dog Vegas KC Show at the end of September. This is a competition open to everyone, so is hotly contested. Well done for qualifying! Out of 33 dogs only two were neither Border Collies nor Kelpies. Tilly came an excellent 9th out of 33!! A good day for Smooth Collies. Sarah Davis & Jess qualified for the YKC Large ABC agility at Crufts 2011! This was held on Sunday 13th March at 10.40 in the YKC ring. Many congratulations to Paul Sensky and Quincy (Coarhabeg Quincy Jones) who won THREE Grade 1 Jumping classes at Barrow Show (2nd-4th July 2010) to go Grade 2!!!! Congratulations to Sarah Davis & Tilly (Cownbred Shecan Cancan) on winning Grade 1 Jumping at PADS on May 30th 2009 and following it up with a win in Grade 1 Agility one week later at North Derbyshire! Out of Grade 1 for life! Enjoy the winning run below! And now Sarah's won out of Grade 2, with both her dogs winning at Wirral at the first attempt at Grade 2!! Many congratulations to Jean Tuck and Ross (Dark Motif from Misstoff AW) who are the first winners of the RSCTA Agility League. They may be runaway winners but they have enjoyed a truly spectacular season culminating in attaining their Agility Warrant. The battle for places behind Ross was much closer with Marie Douglas and her Smooth Collie Beryl (Foxearth Speckled Wood) taking second place in a season where their results just got better and better. 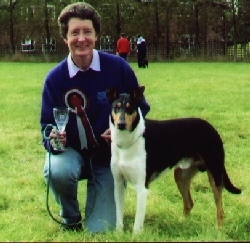 Penny Sensky and Raffles (Alanita Murphy’s Original) took third place in the League, making Raffles the most successful Rough Collie taking part in the League. Paul Sensky and Misty (Tiganlea Telling Tales) just held off a challenge from Jill Garnett and Ebony (Knipes Blaze Away) to take 4th spot. Ross, Raffles and Misty all took their personal rosette counts beyond the 100 mark at various stages of the year. 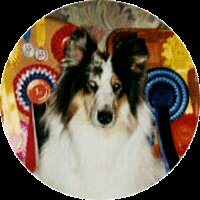 Next year's league promises to be bigger and better as there are more Rough and Smooth Collies who are currently training and should be entering the show scene sometime in 2005. Anyone who would like to participate in the RSCTA Agility League, or knows of anyone else who would be, should contact Paul Sensky on mobile: 07760 252992 or emailing. Alternatively visit the website at www.rscta.co.uk. 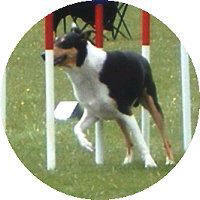 To join the RSCTA Agility League you must become a member of the RSCTA. Entry into the league will cost £2 per dog. To apply for membership, please complete the Membership Application Form and send with the appropriate fee to the Membership Secretary. 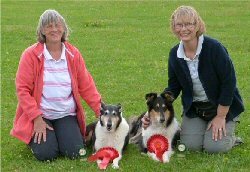 The Association was formed in the early 1990's, initially under the name of The Working Rough and Smooth Collie Association, by a group of individuals who were united in wanting to see these Collies active in areas other than just the show ring. They wanted to see them taking part in all kinds of working activities. Eventually in 1993, the Association gained Kennel Club recognition and became a Registered Society. 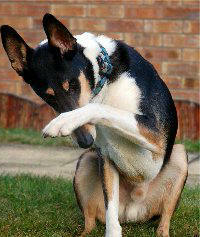 At the request of The Kennel Club, the name was changed to The Rough & Smooth Collie Training Association. Now, with a growing membership, the RSCTA organises its own events around the country to encourage members to work their Collies in activities such as Agility, Obedience, Flyball, Working Trials, Herding, and to have their dogs tested for The Kennel Club Good Citizen Scheme and for Character Assessment. Work as a PAT Dog, Hearing Dog for the Deaf, Dog for the Disabled, or as any other assistant to man is also encouraged. Both versatility and achievement are rewarded.